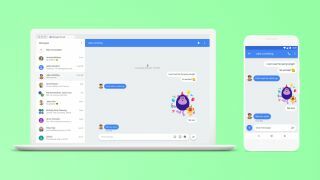 Starting today (June 19), sending and receiving SMS and RCS (Rich Communication Services) text messages from a computer will become easier for Android users, with Google officially rolling out its Android Messages client for web after months of rumors. Working in a similar fashion to the web version of its own Allo messaging service, users can now visit the Android Messages website to generate a unique QR code which will eventually be linked to the Messages app on their handset. While the Android Messages website is already live, the QR scanning component on the Messages app is still in the process of being implemented across all users. Once the app is updated, users will be able to find a 'Messages for web' section in the Android Messages options menu – tapping it will begin the QR code scanning process. An option on the web client has also been added that will allow Android Messages to remember your computer – a good alternative to scanning a new QR code every time you use it. Supported browsers include Chrome, Firefox, Safari, and Microsoft Edge.